This recipe is an adaptation of a well-known Provençal dish. Preheat the oven to 190°C, gas mark 5. 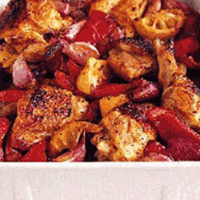 Place the chicken pieces in a large roasting dish. Scatter over the onions, peppers, garlic, lemon wedges and thyme. Drizzle over half the oil, sprinkle over a little sea salt and freshly ground black pepper, cover with foil and cook in the oven for 30 minutes until the garlic is starting to soften. Remove the foil and cook for another 30 minutes or until the chicken is cooked through and the skin is beginning to turn golden. Pour the wine into the pan, trying not to wet the skin of the chicken (this will prevent it from crisping). Drizzle the chicken with the remaining oil and return to the oven for 15 minutes so the wine can mingle with the pan juices and the chicken becomes golden and crisp. Serve the chicken with the juices spooned over the top.